K-9 U-Bathe – Bathe Your The Dog The Easy Way! Once you’ve used the K-9 U-Bathe at Double-C, you’ll never want to wash your dog at home again! 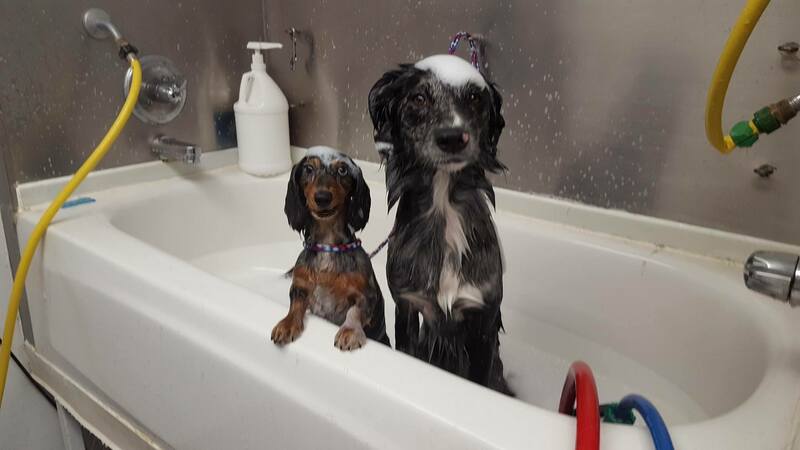 Raised bath tubs, a therapeutic hydro surge bathing system, shampoo, cream rinse, towels, apron, high speed K-9 hair dryer, brushes, music to groom by and a helpful attendant makes cleaning your dog easy & fun. When the bathing is finished, your dog can use one of the exercise yards while you tidy the area. The raised bathtubs save your back, the hydro surge bathing system eliminates hand scrubbing and does most of the work for you. The high speed blower fluffs the coat nearly dry. When you use the K-9 U-Bathe one of our processional groomers will gladly trim your dog’s nails for only $7.75! Come and use our K-9 U-Bathe!